Gain 4credit. You may install 1 card (paying the install cost). Lateral Growth is not just a super-Career Fair for :ETF and :BaBW. Lateral is actually the final piece in the puzzle that makes Jeeves Fast Advance playable out of . The combo works like this: Rezzed Jeeves on the table, 1st corp plays either a click-gaining operation like Biotic Labor or Subliminal Messaging or an agenda installing operation like Casting Call or Shipment from MirrorMorph, next are spent on Shipment from SanSan. spent on Operations triggers Jeeves to gain a which is spent to put the final advancement on the agenda. This will allow the corp to score a 3/2 from hand, unless Biotic Labor was played, in which case the corp could potentially score a 4/2 from hand. Throw in CVS to counter Clot and the agenda is as good as scored. Up til now NEH has been the most logical ID to play Jeeves fast advance, since both Casting Call and Shipment from SanSan are influence free, having the best 3/2 Agenda (Astro of course) and asset spam mixed with SanSan City Grids giving Jeeves a good chance to survive (except against Whizzard). 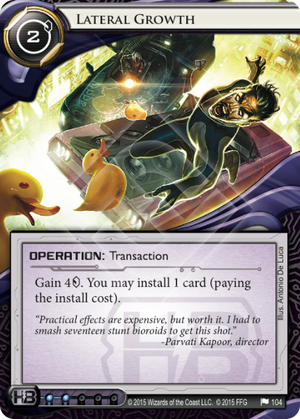 Lateral Growth's strength is that it is a positive tempo card, for the cost of a you get an install and gain 2/3. This compares quite favourably to the other 1st options which either cost s like Biotic or Mirrormorph, influence like Casting Call or are potentially awkward like Subliminal Messaging (if you use it, it might not be available for the combo). Lateral Growth may even be worth including in a deck that doesn't run Jeeves FA - the numbers are certainly comparable to Hedge Fund out of ETF/BaBW. There is also another use for Lateral Growth. If paired with draw effects like Jackson Howard or Blue Level Clearance - you can productively use two cards from hand with a single , potentially saving you from discarding useful cards.